If you are short on time to make this soup, it's fine to take a few shortcuts. For instance, you could skip making the stock and use pre-made chicken stock. You might also substitute canned beans for dried. But if you want the most flavorful soup, taking the time to make your own stock will escalate it to new heights. 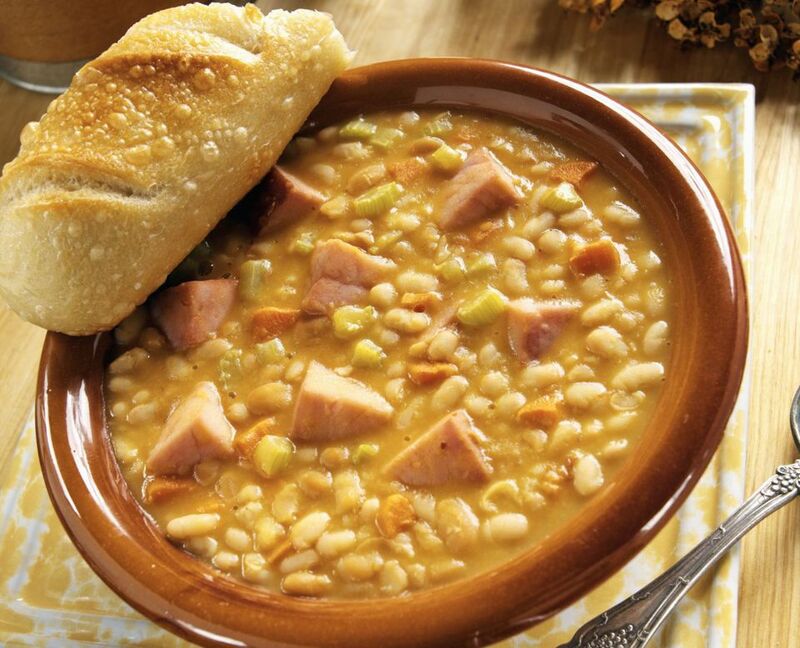 The richness of flavor comes from the beans soaking up the homemade stock as they cook and, of course, the country ham. Place ham hock, quartered onion, large pieces of carrot and celery, bay leaves and peppercorns in a large soup pot. Add 5 quarts cold water and set over medium heat. Bring to a vigorous simmer (do not boil), reduce heat to low and cover. Cook for about three hours. And then let it cool. Pour stock through a strainer into a large bowl. Discard vegetables. Cut up meat from ham hock into small pieces and add to stock. Cover and cool to room temperature or overnight in the refrigerator. Divide stock and freeze half for later use. Heat bacon drippings in an ovenproof soup pot over medium heat. Add onions, celery, and carrot and saute until onions are translucent. Add beans and stock to pot along with all remaining ingredients except water. Place pot over medium heat and bring to a vigorous simmer (do not boil). Cover and place on a lower, but not the lowest, oven rack. Cook for about 4 hours, checking every hour and adding enough additional hot water to keep beans well covered. Remove from oven, adjust seasonings and amount of water. Serve with hot sauce on the side. Note: This soup freezes well if you want to double it and freeze half.